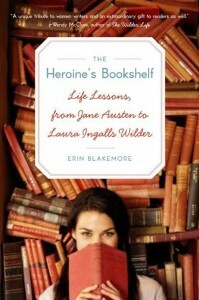 Let me tell you a little bit about The Heroine's Bookshelf, by Erin Blakemore. Blakemore takes us through her connections with not just several incredibly well known female authors, but also reunites us with characters that have stood tall through history. Characters like Lizzy of Pride and Prejudice, Scarlett in Gone with the Wind, and Jo, of Little Women. I think that this book is empowering, motivational, and inspiring to women readers everywhere. Unfortunately, although some of that is true for me, parts of it fell flat because I have not read many of the books that she speaks of. Gasp! I know. Crazy, right? I've never read Little Women. Never seen Gone with the Wind. Barely remember Pride and Prejudice. But that's okay. I still found myself moved by certain parts of this book. And I want to touch on my most favorite chapter with you all. Dignity. Dignity is the chapter that focuses on Alice Walker's The Color Purple. And the character of Celie. Now, I sadly admit that I've never read the book. I've never even seen the movie in its entirety. But this chapter touched me in such a way that I want to. I have to go out and get my own copy. I don't know that this is what our author intended, but it happened for me. Her notes at the end of each chapter speak to when you should pick up a copy of the book she just discussed, and for me, though important to the novel, these recommendations aren't why I want to read The Color Purple. Blakemore's description of Celie, the way she persevered, and her words on Walker, and her own true life ways of prevailing, were enough to inspire me to say to myself - THIS? This is a woman whose words I need to read. I can't say too much more or I'll give you the entire chapter. And since it's my favorite I think you should pick up a copy of the book and read it for yourself. It also so happens that she's made me want to reconnect with one of my favorite childhood characters, as well. Laura Ingalls. I used to devour those books as a child. I cannot wait for my own daughter to be reading enough that she can do the same. So while some of this read was a miss for me, the parts that were a hit were truly able to impact my mindset. I think if you're a fan of women's literature and have an interest in remembering your favorite stories, along with reconnecting with your favorite authors on a whole new level, this book is one you'll want to look into. You HAVE to do it! You must read The Color Purple. It's amazing, truly! And I loved The Little House series too! Sounds like this is a good one for a scim read. Some parts are good, others not so much. I'll check it out too. I just read THE COLOR PURPLE for the first time last year and you definitely have to read it - it is an amazing book! Celie is ... well ... she's amazing. Thanks for your review for the tour! I'm willing to bet that the author would consider you a success. She made you want to pick up one new book and reread another book. Well this title will certainly go on my must-read list right this very moment. Thanks so much for introducing this book to me...I bet I'm going to love it!